Posted on 20, September 2016 by EuropaWire PR Editors | This entry was posted in Education, Sports, United Kingdom and tagged elite athletes, Loughborough University, Richard Taylor, sport-specific accommodation. Bookmark the permalink. Leicestershire, UK, 20-Sep-2016 — /EuropaWire/ — Loughborough University has revealed plans for potential new accommodation on campus. Around £40 million would be invested in the project, creating sport-specific accommodation to secure Loughborough’s place as a training centre for elite athletes. It would also see the construction of new bedrooms to satisfy demand from new and returning students for places in halls of residence. Subject to planning approval, the new accommodation will be built on a site adjacent to the existing High Performance Athletics Centre. Approximately 600 rooms will be built, including up to 70 student athlete rooms and 40 elite athlete rooms. The rooms will have a similar design to existing accommodation on campus. Some will be specifically designed for elite athlete short term accommodation, including those with disabilities. State-of-the-art nutritional facilities will also be incorporated into this part of the scheme. The student rooms will be a mixture of en-suite rooms and cluster flats that will have shared kitchen facilities. A further feature of the project will be highly innovative and sector leading physical activity opportunities designed to support the well- being of students, staff and visitors. These plans will discourage the use of cars and promote cycling, walking and running in and around campus. The proposed project start date is August 2017, with completion scheduled for September 2019. 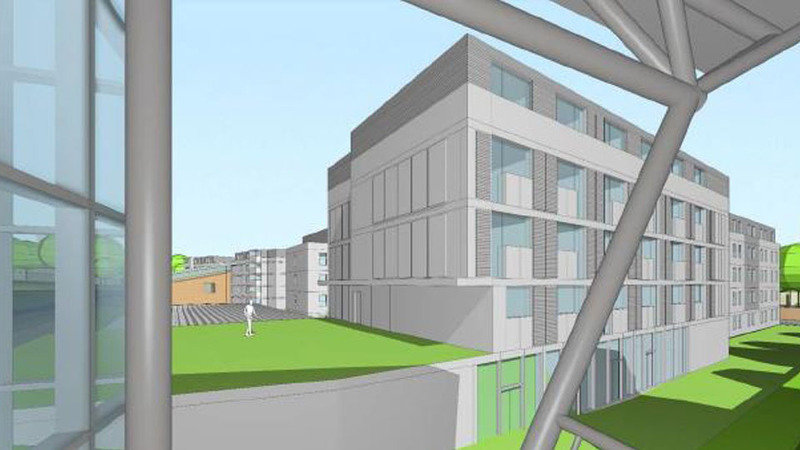 Richard Taylor, Chief Operating Officer at the University comments: “Our community partners continue to highlight a wish for the University to invest in student accommodation on campus so as to minimise the impact on housing in the town and the new proposed plans are our response to this. “Our current residences are operating at full capacity as a result of existing student numbers. We cannot accommodate all those who would wish to be in hall. “The dedicated sports accommodation element to this scheme will cement Loughborough’s status as arguably the best training environment for elite athletes in the country. Local residents are invited to attend a community briefing prior to the University’s submission of the planning application for the new development. The aim of the event is to gain feedback from residents and answer any questions. The community briefing event is set to take place at The Link Hotel, Thursday 29 September, 5.30pm – 8.30pm. Light refreshments will be available.